Simplify your accounts payable process. QuickBooks Bill Pay is a fast and convenient way to stay on top of your finances! concentrate on more critical business issues. accuracy in payables processing and greater control over cash flow. time, a small business can save thousands per year by handling accounts payable online. Establish internal business controls for creating, reviewing and sending payments. Include invoice and credit memo details with payments to obtain proper credit from vendors. Aggregate multiple outstanding invoices or bills from a vendor into one single payment. Automatic entry of transactions into your QuickBooks register means no need for duplicate data entry to maintain a record of your transactions. Authorization levels dictate who has access to your accounts. Final payments are sent only when you release them, and are protected with a password (PIN) issued only to you. Make payments from up to 10 different accounts at no additional cost. Create a stored payee list so you only have to enter your vendor information once. 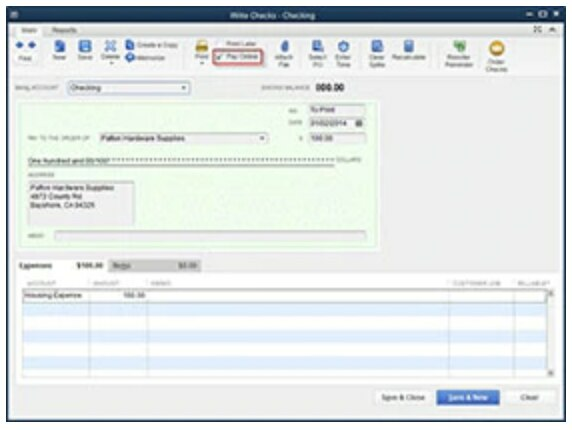 Print images of checks and file with invoices for detailed record-keeping. Request a stop payment at any time prior to your specified delivery date. From the Banking menu, choose Bank Feeds, then select Set Up Bank Feed for an Account. You may see a message: "All open QuickBooks windows will be closed temporarily to set up online banking services. Do you want to continue?". Click Yes. Select your QuickBooks account, then click Next. Enter or select QuickBooks Bill Pay - New! as the name of your financial institution and click Next. Enter your QuickBooks Bill Pay customer ID and PIN. Confirm your PIN, then select Sign In. Select Finish to close the setup wizard and view the Online Banking Center in QuickBooks. Once you've enabled your accounts, you can set up your payees. You can send online payments to anyone in the United States who has an address and a phone number. From the Lists menu, choose the type of payee (vendor, customer, etc.) for whom you want to enter information. Employees cannot receive online paychecks, but can receive other types of online checks. If the payee already exists, choose the payee, and then choose Edit Vendor from the Edit menu button. Or, if you're creating a new payee, choose New Vendor from the Edit menu button. On the Address Info tab, enter the payee's name, address (street, city, state, zip), phone number, and any other information you want to specify. On the Additional Info tab, enter the account number the payee uses to identify you, then click OK. If the payee does not have an account or policy number for you, enter a note or other information. From the Banking menu, choose Online Banking, then select Set Up Account for Online Service. You may see a message: "All open QuickBooks windows will be closed temporarily to set up online banking services. Do you want to continue?". Click Yes. Once you're finished creating your online payment instructions, send them to the QuickBooks Bill Pay service. From the Banking menu, choose Online Banking, then choose Online Banking Center. Select "QuickBooks Bill Pay - New!" in the Financial Institution dropdown. Make sure each of the instructions you want to transmit is checked in the Items to Send section. Depending on your version of QuickBooks you may see a single list or a categorized table with links for more detail. Depending on your version of QuickBooks, click "Go Online" or "Send/Receive Transactions". Enter the required PIN information, then click OK. QuickBooks sends your online payment instructions to the QuickBooks Bill Pay service. Allow a few days after the delivery date for the payment to show as cleared. Usually the payee takes a few days to process payments, and your financial institution needs a day or two to clear it and make the information available. When creating your online payment from the Write Checks screen, select the Transmit Memo checkbox to have the payee receive a voucher containing the memo information you entered on the check (in addition to the check with the account number on it). When creating your online payment from the Pay Bills screen, select the Include Reference No. checkbox to have the payee receive a voucher containing the information you entered in the Reference No. column on the Pay Bills form (in addition to the check with the account number on it). How Does QuickBooks Bill Pay Work? QuickBooks Bill Pay uses the Automated Clearing House (ACH) or MasterCard RPS network to electronically transfer your payments from your financial institution to your payee on the date you specify. If a company or individual is not able to receive electronic payments, a check is sent via the US Mail. Are all payments made electronically? While many of your payments will be made electronically, some payees (and, of course, individuals) cannot receive electronic payments. For payees that cannot receive electronic payments, a laser printed check will be sent to arrive on the specified delivery date, provided you have allowed four business days for payment. Laser printed checks are processed the same way as your personal checks. Why do I need to allow 4 days to process my payment? For payees that can receive electronic payment, payments can be delivered as soon as the next business day. However, for those payees who are not set up to receive electronic payments, the QuickBooks Bill Pay service will create and mail a check. As a result, it is important that you send your payment instructions at least four business days before the desired payment date. Your monthly service fee will automatically be deducted from your designated checking account on a monthly billing cycle. How will I know which payments have been made? Once a payment has been made, it will be clearly itemized on your monthly bank statement. Are there any payments the Service prohibits? Tax and court-ordered payments are discouraged. Payments outside the U.S. are prohibited. What if a payment I made has not cleared my account? Call the payee directly. Usually the payment will have posted by this time and any questions can be easily resolved. If the payment has not posted, follow the next step. Send a Payment Inquiry message via QuickBooks built-in e-mail. You'll need to provide the payee contact name, address and phone number. We'll provide proof of payment to your payee. If the posting problem was due to our payment processor's error, we will resolve the matter directly with your payee, including any late fee up to a maximum of $50. Do I need new equipment or software? You need a checking account at a bank that offers online banking with QuickBooks, an Internet connection and a version of QuickBooks that supports online banking. Protecting the security of your financial information is a priority. Your online payment instructions are sent using a secure Internet connection and SSL encryption technology, and protected with a password (PIN) issued only to you. You will also find free online Help, and well as answers to many Frequently Asked Questions, on our service provider’s Web site at www.checkfreecorp.fiserv.com. First month is free up to 20 payments. Additional sets of 10 payments will be billed at $6.95 per set. Tax payments and court-ordered payments are discouraged and made at your own risk and with no guarantee. Payments to payees outside of the United States are not allowed through this service. For payees that can receive electronic payment, payments can be delivered as soon as the next business day. In general, however, and for other payees who are not set up to receive electronic payment, we recommend that you schedule your payment delivery at least four business days in advance of the due date even though some payments can take less time. The Service will bear responsibility for any late payment-related charges up to $50.00 should a payment post after its Due Date, as long as payment was scheduled in accordance with the guidelines described under ‘Payment Scheduling’ in the Terms and Conditions. This guarantee does not include tax payments or court-ordered payments.